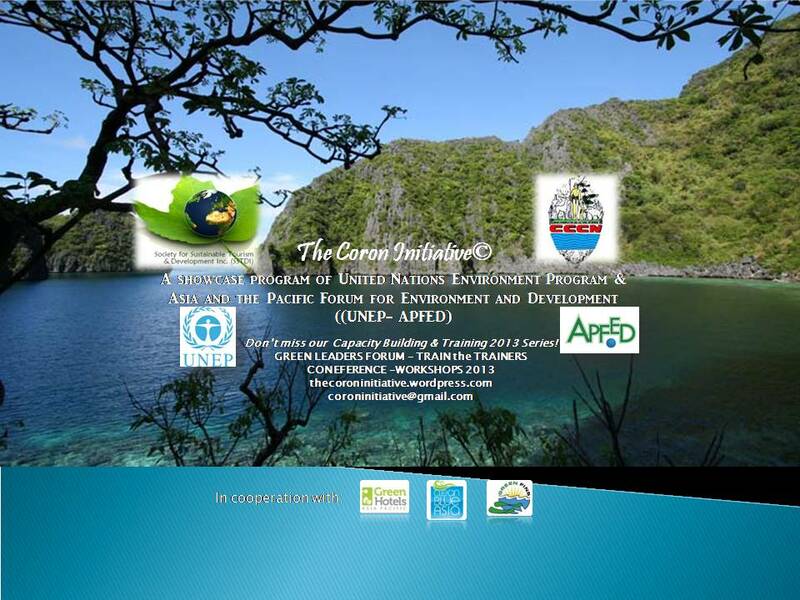 The Calamianes Cultural Conservation Network Inc.(CCCNI)and the Society for Sustainable Tourism & Development, Inc.(STTDI)jointly organized The Coron InitiativeCapacity Building & Training Conference & Workshop Series 2013 for Environmental Conservation, Social Responsibility and Sustainable Tourism, as a showcase program of the United Nations Environment Program (UNEP)- Asia Pacific & the Asia and the Pacific Forum for Environment and Development (APFED). 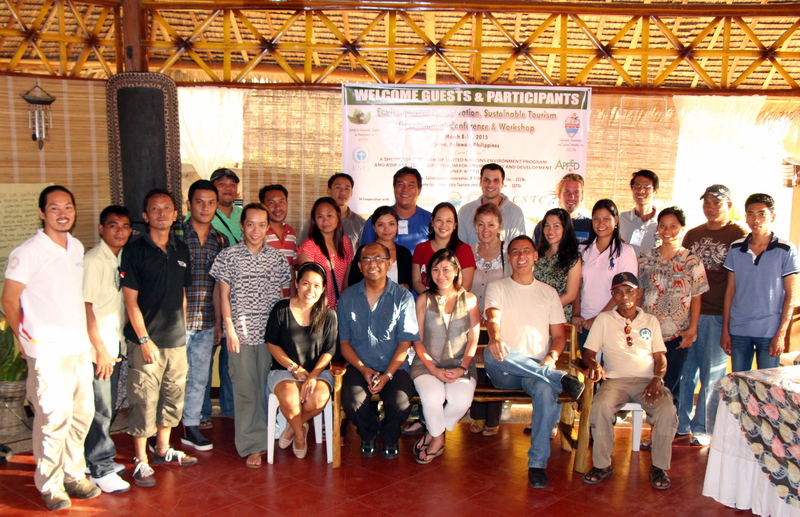 After the successful 1st Environmental Forum held last November 2011, wherein public and private stakeholders of Coron & Calamianes Islands forged a cooperation in environmental responsibilities, concerns and solutions, the TCI with support from Society for Sustainable Tourism & Development has embarked on its Capacity Building & Training Programs for Sustainable Tourism, Environmental Conservation & Stewardship, Social Responsibility and Economic Development for Grassroots towards a Green Economy. These Capacity Building and Sustainable Tourism Development and Stewardship training can engage not only the Coron & Calamianes Islands stakeholders but was also open to all public and private stakeholders, who wish to train and build capacity in the development and stewardship of their natural- or cultural based tourism. Ultimate output is to foment a comprehensive environmental protection, socio-cultural responsibility and equity and sustainable tourism development framework for destinations which can be a replicable model in the Philippines & Asia Pacific. The Capacity Building & Training is open to ALL interested in Environment Conservation, Social Responsibility & Sustainable Tourism development & stewardship, triple bottom line businesses, in the tourism industry. Like our Facebook Page, Society For Sustainable Tourism & Development Inc. 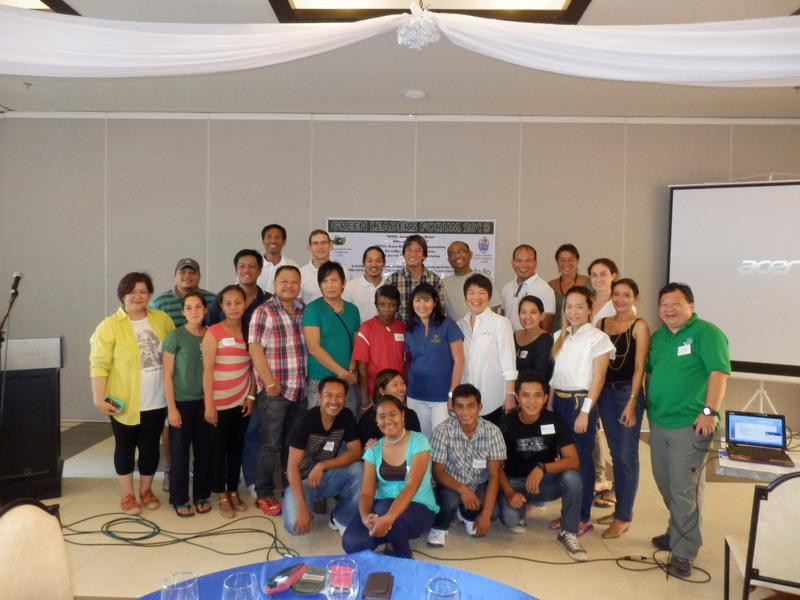 Check out PHOTOS of The Coron Initiative Capacity Building Series, HERE. For more articles about The Coron Initiative from the media, please read HERE. Thank you for what your group is doing to save life on earth and protecting the environment. I am a Dutch citizen, have strong connections to the Philippines and am excited about your initiative on sustainable and ecological tourism! Good to read all the challenging plans and goals. What i still miss though are examples and more details about concrete projects on sustainable tourism. I am also curious about the connection with Bacolod as the project focuses more on Coron. My connection with the Philippines stems from 2001 when i was a volunteer for Habitat building houses in Bayanihan village/Talisay. In 2002 i did the same in Dumaguete. The Philippines stole my heart and later i met my wife Anna Fermin who lived in Manila. We both live in Alkmaar and got married July 2011. Tourism and specially sustainable tourism has always interested me. I really hope this initiative will be successful so that the Philippines as economy and the Filipinos will benefit from this. So please give me some examples or results so far of the initiative. By the way how can i contribute to the project? Thank you for your comment. We appreciate your interest and support to sustainable tourism. With regards to Bacolod City, where our SSTDI NGO is based, we have in fact started several Sustainable Tourism conferences and workshops with various stakeholders for the past 3 years. Check out our blog posts about Negros Occidental. Regarding our other ST Initiatives, they are still a work in progress, educating and building capacity to host communities and local stakeholders who are willing and able to embrace Sustainable Tourism development and stewardship, environmental conservation and best green practices in hospitality and travel. At the moment, we have an ongoing project named “Green Reconstruction for Sustainability and Resilience for Coron“, recently devastated by Typhoon Haiyan. We hope you can contribute to this project. For more information on how you can help, please click HERE or email us.